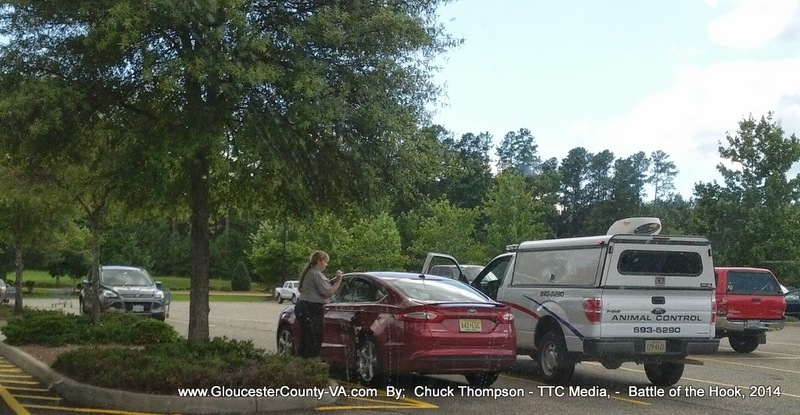 Gloucester VA Links and News: Gloucester, VA Animal Control Breaking And Entering? What About "YOUR" Rights? (a) It shall be unlawful to leave any animal in a vehicle without the benefit of air conditioning when the outside temperature reaches eighty (80) degrees fahrenheit or greater. (b) Any person who confines an animal in an unattended vehicle so as to cause the animal to suffer from heat stress, shall be guilty of a Class 1 misdemeanor. 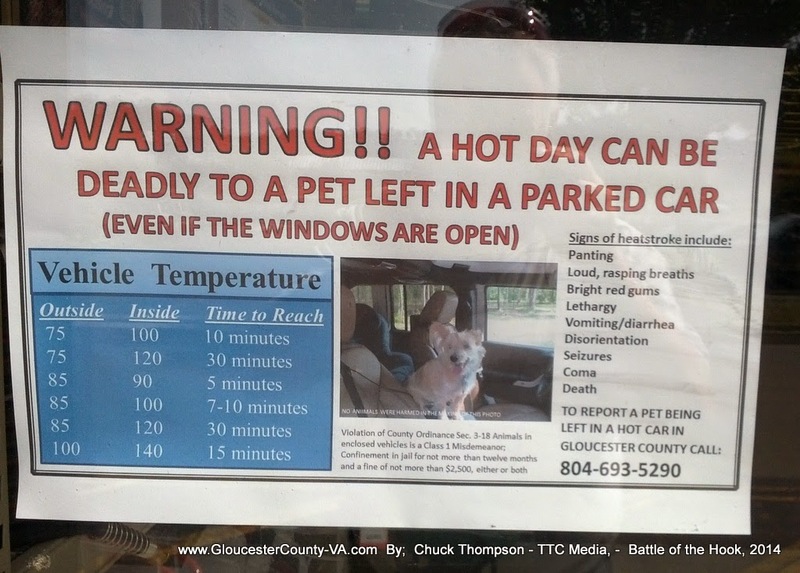 The animal control officer or other officer shall have the authority to remove any animal found in an enclosed vehicle that appears to be suffering from heat stress. The animal shall be provided immediate veterinary care. The animal owner or custodian shall be responsible for all expenses incurred during the removal of the animal or its subsequent treatment and impoundment. (c) In the event that the person responsible for the violation cannot be ascertained, the registered owner of the vehicle, as required by Chapter 6 of Title 46.2 of the Code of Virginia, shall constitute in evidence a prima facie presumption that such registered owner was the person who committed the violation. 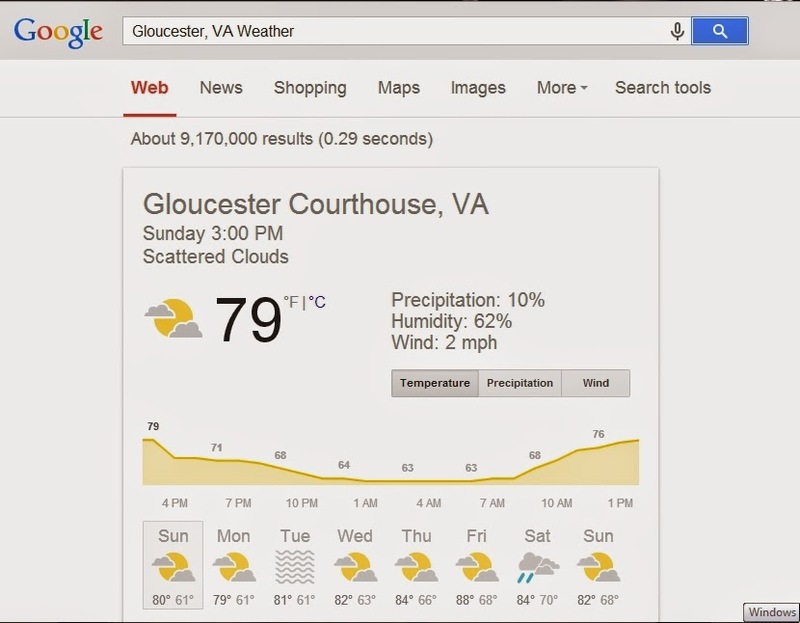 Now let's look at what the temperature reading was for the time period in question. The time these photos were taken are from around 3:12 PM through 3:24 PM August 24th, 2014. 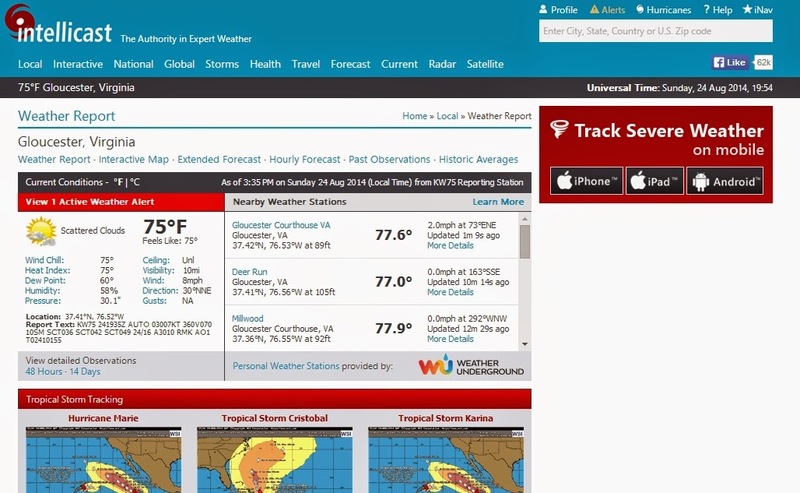 We took screen shots from various weather services to see what an average overall temperature reading was during the time in question. Well, from everything we could see, it was under the 80 degree Fahrenheit limit that the ordinance states is required to be in violation of the above listed ordinance. Again, the ordinance is highly questionable and in our view, illegal. There is no corresponding state code and with Virginia being a Dillon Rule state, the Dillon Rule has been violated by Gloucester County from what we see. 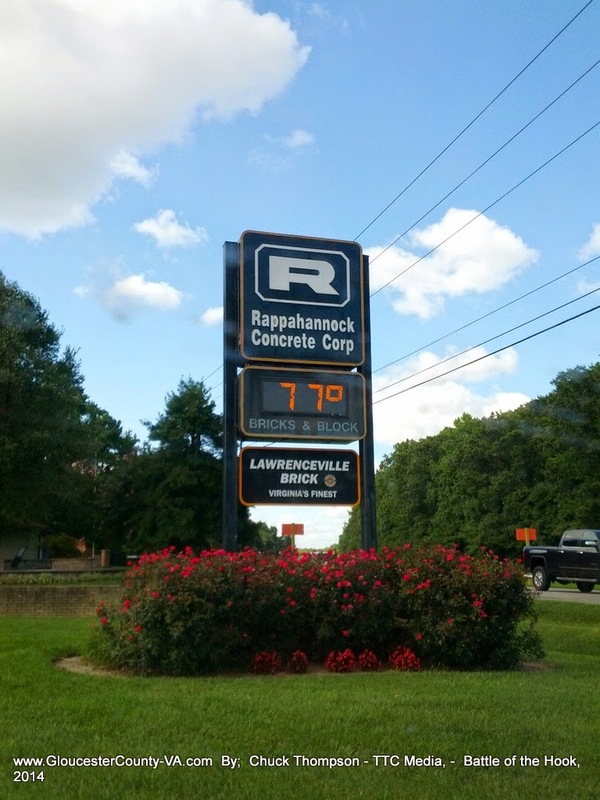 Here is a picture of the temperature taken just right down the road from where the incident was witnessed. 77 Degrees. Not 80 degrees or above. But we have found evidence that county officials have decided that they can't even follow their own codes and have decided to step up the violations. See the picture below. The picture you are viewing is a sign hanging up on the front door of Tractor Supply here in Gloucester, Virginia. Note that it says nothing about the actual ordinance and what that ordinance actually states. It also gives no warning that Animal Control will break into your vehicle and take a pet which is considered personal property if they think they can get away with this. What one must also note is that the sign does not cover temperatures in the 80 degree range as stated in the county ordinance. What gives? In fact, it leads one to believe that a violation occurs at temperatures at the 75 degree range. The picture also fails to point out whether those inside temperature readings are for open or closed windows of any vehicle. Getting back to the entire incident. There was a dog in the red car which is a 4 door vehicle. All 4 windows were down in the car and the car had not been there for very long. This incident was witnessed from start to finish. Laura Dickie agitated the dog inside as the dog considered her a danger. 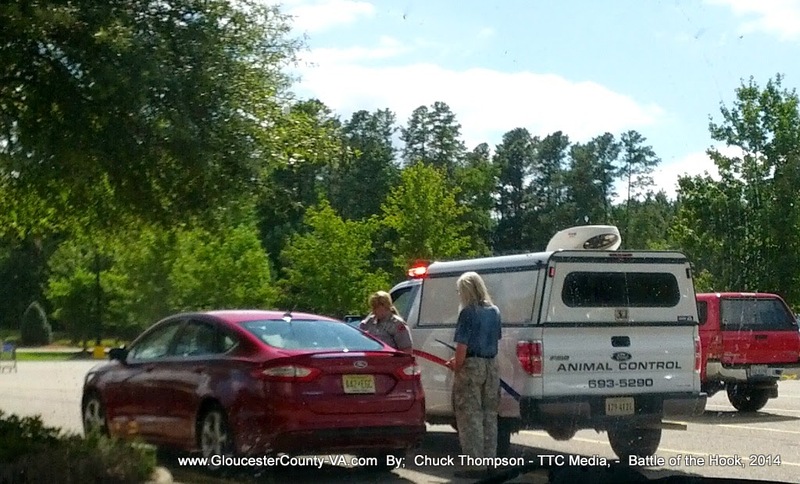 The man with the long white hair and camo pants is the person who called in what he considered a violation to the Gloucester County Animal Control ordinance listed above. 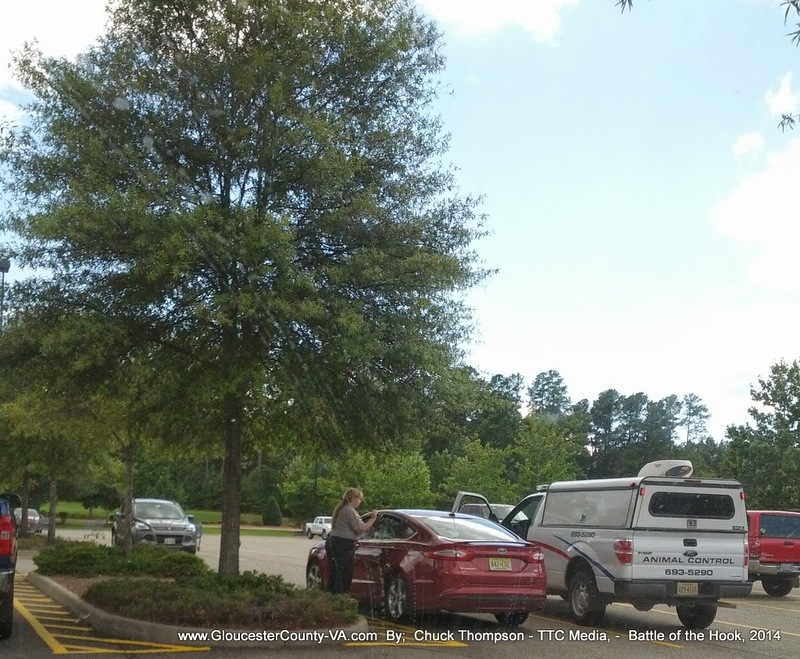 Just before Ms Dickie was ready to bust out the window on the vehicle, the person renting the vehicle came out of Wal Mart and came back to her vehicle. The conversation was overheard and it was overheard that Ms Dickie was in fact getting ready to bust out the window and take the dog from the vehicle. Here is a very serious question. Where is the search warrant that would allow law enforcement to do this and where were the local sheriff's department to back her up? Animal Control officers can not execute search warrants in Virginia. It has to be done locally by the Sheriff's department. Again, where is the search warrant? There is nothing in Virginia State Code regarding animals that allows Animal Control to break into your vehicle that we have ever seen. Please see VA Code 3.2-6500 and beyond for state Animal Control codes. The owner of the animal and in charge of the rental car was not charged with any wrong doing whatsoever. But Animal Control was still getting ready to bust the window and take the owners dog, hence personal property without notice. Another question that comes to mind, why didn't Laura Dickie just go into Wal Mart and see about having the owner paged before even considering such drastic measures? Well, did you see the fine for the above so called violation? Up to $2,500.00 and up to one year in jail? It's on the sign shown above. That is financial incentive for Animal Control to bust out some windows on people's vehicles. Can you imagine all the legal troubles these folks would have had to face had they shopped for only 5 more minutes? They were from out of state and spending money here in our economy. 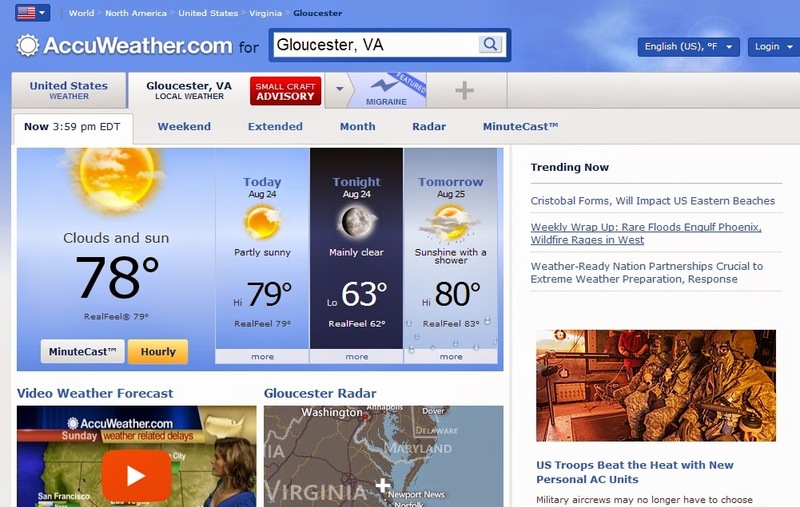 What kind of message are we sending visitors to Gloucester County? What kind of message is being conveyed to the local citizens? Anyone now understand why we have been arguing against this insane ordinance now? And again, this is only one of a number of county ordinances that have no place being on the books as they do not meet the Dillon Rule. It's time for this nonsense to stop. Oh, and the Animal Control truck above? There is no air conditioning that the animal would be put in. That truck only has a top air vent. The animal would be transported in violation of the county's own code. What on Earth is that? The hypocrisy.